The landscape of U.S. Youth and amateur soccer has changed immeasurably over the last two decades. From the inception of the MLS in 1993, and its subsequent first season as major professional league in 1996, U.S. Youth and amateur soccer has seen an exponential rise in both popularity and participation. Increased participation numbers have allowed the formation of many leagues, divisions, and even governing entities for the ranks of youth and amateur soccer in America. With US Soccer (USSF) overseeing the entire game as an umbrella organization, and US Youth Soccer (USYS) and US Club Soccer (US Club) looking after most youth soccer – as well as High School (NFHS), College (NCAA and NAIA) and Adult Amateur (USASA) for the older groups – soccer in America below the professional and semi-professional levels is in rude health. This should lead to a healthy development system that caters for a lot of players, and creates a pyramid of levels to ensure every player plays at the level that they are best suited to, with elite players playing against each other, intermediate players playing at their level, and so on. Unfortunately, though, this is regularly not the case. In the 70s, 80s and 90s, although soccer was popular, it was still somewhat of a niche sport. The “Big Three” were (American) Football, Basketball and Baseball, with Ice Hockey not far behind those. People played soccer, but it was often a case of “few and far between”, with the game being played predominantly by first and second-generation immigrant populations. What would happen, then, as time went on, was that leagues and teams would be formed – mostly based around towns and counties – and a Fall and Spring season would be played. This created a year-long interest in the game, and would allow teams to retain players from year to year, leading up to the high school ages and high school teams, and then – if a player was talented – a chance to play in college, and beyond, if they were lucky. But with these small leagues came a problem: some teams in some areas would become so dominant, that there was no challenge in playing year after year, and their rosters would almost always be stacked compared to the rosters of their competitors. All athletes love a challenge, and boredom leads to complacency and apathy. So teams would seek out new competition – firstly on a State regional basis, where the same problem become apparent – the same 3-6 powerhouse club teams would continually play each other, and the same problem of complacency would creep in. So clubs and teams would look further afield, playing teams from other states. But this, of course, meant a lot of travel. And from there, tournaments were born. Probably no country puts as much stock into soccer tournaments as America does. Every bank holiday weekend across the country, thousands of teams travel to one tournament or another, often out of state (or in-state for the lowest level teams), and sometimes – depending on how high up the talent pyramid the team is – halfway across the country. Standings are kept, and national ranking points are doled out. But again, the same issue raises its head – the powerhouse clubs who can afford – financially and talent-wise – to travel further afield for top tournaments, end up playing the same top teams time and again. In much the same vein as the professional leagues, where Barcelona, Real Madrid and Atletico would be expected to meet in the semi-finals of their cup, or to compete for their league, the same youth clubs tend to place well in the same tournaments that they all go to, or qualify for. The downside though, is that they all pretty much play the same style of soccer, with much the same formations, and with no variation or surprise in any games, for the most part. This is what creates a “development ceiling” for U.S. Soccer. The solution, of course, is to take the next logical step – to travel abroad to play the very best of the very best. It is no secret – nor is it a controversy – that the major tactical innovations of the game happen in both South America and Europe. 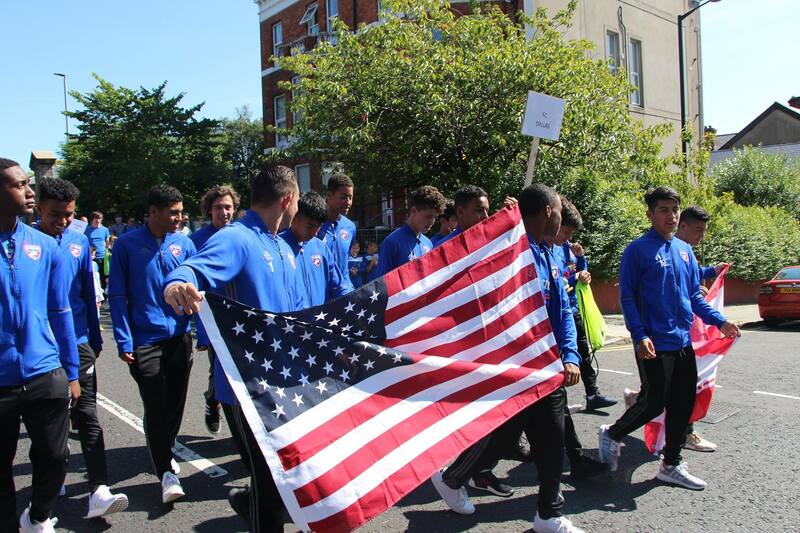 Top level youth teams from America can expand their tactical understanding by traveling to Europe or South America to play in tournaments (such as the famed “Super Cup” in Northern Ireland), or to play friendly games against top-class academies. In terms of soccer education, it would offer something they would never be able to get at home, which is exposure to many varied styles of play, different formations, and a different tempo in every game. Culturally, they would expand their knowledge of life outside of America – an opportunity the majority of Americans never get to experience. Companies such as DB Sports Tours offer tailor-made tour packages that help teams to play international opposition in the locations they desire, at the level they need to play, and against the coaching philosophies they want to be exposed to. Of course, traveling this far away from home to play soccer can be financially daunting, but tour operators like DB Sports Tours help coordinate with clubs to find the best package available for the needs of the club and its families. With international travel to Europe as cheap as its ever been, and with plentiful flights at any time of year to continental destinations, the opportunity to expand a team’s tactical horizons is one not to miss out on; and it doesn’t stop with youth soccer, either. College teams looking to take full advantage of their Spring game and training allotment are prime candidates to play similar-age teams abroad, in an attempt to raise the intensity and tactical variation of their game. With the college season being so relatively short, the games are often fast-paced, more direct than the teams and coaches might want them to be, and with little recovery time between games. The chance to go to Europe to play against teams who deliberately play slowly – no matter the pressure they are up against – would surely give those teams an advantage when they returned to play their college season the following year. It is an opportunity that coaches of all competitive ages in America should be looking at. They say a “rising tide lifts all boats”, and if this is true, then raising the standard of the youth game in America will lead to a higher standard for the national teams. Although on the woman’s side success has been plentiful, other nations are starting to catch up, and the advantages that the womens team once enjoyed are rapidly fading. Similarly, the men’s team has come on in great strides over the past 20 years, but have never seemed to quite fulfill the potential that the sheer number of registered players at the youth level would suggest. Exposure to many different tactical formats at the youth ages would surely prepare senior players for the same experience in international soccer. And there is no better time than the present for clubs and coaches to get in touch with a tour operator to arrange such experience. At the highest youth levels, it could be the difference between being a relevant club that wins trophies and develops national team players consistently – or being a club that has success but never finds its highest level and contribution to the overall health of US National soccer.